Please find below academic references relating to the use of Trailmaster products and other camera traps. Viewable article will be annotated by a pdf logo or other notations. If you wish to contribute to this reference site please send us a copy of your work as an e-mail attachment to webmaster@trailmaster.com or mail us a copy to the address shown. We at TrailMaster thank you for your continued support. We hope that this reference area will be of help to you. If you have any suggestions please e-mail us with your ideas. The Snow Leopard Conservancy (SLC) conducted a camera trap study in Hemis National Park, Ladakh, India from 2001-2004 to develop a standardized methodology for censusing snow leopards (Uncia uncia). Lower resolution “Screen Version” (pdf file – 2.7 Mb). Higher resolution “eBook” (pdf – 4.3 Mb). Those interested in learning more about camera trapping snow leopards can download our definitive Handbook by clicking here. Archer, A. L. 1994. A survey of hunting techniques and the results thereof on two species of duiker and the suni antelopes in Zanzibar. Zanzibar Forestry Technical Paper 17. Zanzibar: Dept. of Commercial Crops, Fruits and Forestry. Archer, A. L. & Mwinyi, A. A. 1995. Further studies on the two duikers species and the suni antelope in Zanzibar. Zanzibar Forestry Technical Paper 19. Zanzibar: Dept. of Commercial Crops, Fruits and Forestry. Beentje, H. J. 1990. A reconnaissance survey of Zanzibar forests and coastal thicket. Zanzibar: FIN NIDA, Dept. of Environment, Commission of Lands and Environment. Burgess, N. D. 2000. Global importance and patterns in the distribution of coastal forest species. In N. D.
Burgess & G. P. Clarke (eds. ): Coastal forests of eastern Africa. Pp. 235–248. Cambridge: IUCN. Burgess, N. D., Clarke, G. P. & Rodgers, W. A. 1998. Coastal forests of eastern Africa: status, endemism patterns and their potential causes. Biological Journal of the Linnean Society 64, 337–367. Burgess, N. D. Kock, D., Cockle, A., FitzGibbon, C., Jenkins, P. & Honess, P. 2000. Mammals. In N. D.
Burgess & G. P. Clarke (eds. ): Coastal forests of eastern Africa. Pp. 173–190. Cambridge: IUCN. Burgess, N. D., Mwasumbi, L. B., Hawthorne, W. J., Dickinson, A. & Doggett, R. A. 1992. Preliminary asssessment of the distribution, status and biological importance of coastal forests in Tanzania. Biological Conservation 62, 205–218. Burton, R. 1967 . Zanzibar: city, island, and coast. Vol. 1. New York: Johnson Reprint Corp. CITES Appendix 1. 2003. On the internet at www.cites.org/. Clarke, G. P. 2000. Defi ning the eastern African coastal forests. In N. D. Burgess & G. P. Clarke (eds. ): Coastal forests of eastern Africa. Pp. 9–26. Cambridge: IUCN. Davies, G. & Vanden Berghe, E. (eds.) 1994. Check-list of the mammals of East Africa. Nairobi: East Africa Natural History Society. Dunkel, T. 2002. Caught in the act: camera traps in remote spots document rare or “nonexistent” animals, helping conserve wildlands. Smithsonian December, 27–28. Ellerman, J. R., Morrison-Scott, T. C. S. & Hayman, R. W. 1953. Southern African mammals, 1758–1951: a reclassifi cation. London: British Museum (Natural History). Estes, R. D. 1999. The safari companion. Totnes, UK: Chelsea Green Publishing Co.
Finnie, D. 2002. Ader’s duiker (Cephalophus adersi) species recovery plan (revised). Zanzibar Forestry Technical Paper 124. Zanzibar: Dept. of Commercial Crops, Fruits and Forestry. Goldman, H. V. & Walsh, M. T. in press. Is the Zanzibar leopard (Panthera pardus adersi) extinct? Journal of East African Natural History. Goldman, H.V. & Winther-Hansen, J 2003. The Small Carnivores of Unguja. Results of a photo-trapping survey in Jozani Forest reserve, Zanzibar, Tanzania. Ingrams, W. H. 1967 . Zanzibar: its history and its people. London: Frank Cass & Co. Ltd.
Jackson, R. & Hillard, D. 1986. 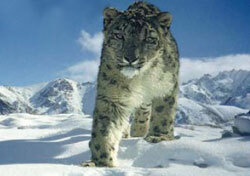 Tracking the elusive snow leopard. National Geographic 169, 792–809. Kingdon, J. 1977. East African mammals: an atlas of evolution in Africa. Vol. III Part A (Carnivores). Chicago: University of Chicago Press. Kingdon, J. 1989. Island Africa: the evolution of Africa’s rare animals and plants. Princeton: Princeton University Press. Kingdon, J. 1997. The Kingdon fi eld guide to African mammals. San Diego: Academic Press. Kingdon, J. & Howell, K. M. 1993. Mammals in the forest of eastern Africa. In J. C. Lovett & S.
K. Wasser (eds. ): Biogeography and ecology of the rain forests of eastern Africa. Pp. 229–241. Cambridge: Cambridge University Press. Leskinen, J., Pohjonen, V. M. & Ali, M. S. 1997. Woody biomass inventory of Zanzibar islands. Zanzibar Foresty Technical Paper Series 40. Zanzibar: Dept. of Commercial Crops, Fruits and Forestry. Lorenz, L. von L. L. 1898. Säugetiere von Madagascar und Sansibar, gesammelt von Dr. A. Voeltzkow: reisen in den jahren 1889–95. Abhandlungen der Senckenbergischen Naturforschenden Gesellschaft 21(3), 443–469. Mansfi eld-Aders, W. 1967 . Chapter XXII: the natural history of Zanzibar and Pemba. In F. B. Pearce: Zanzibar: the island metropolis of eastern Africa. Pp. 326–339. London: Frank Cass & Co. Ltd.
Marshall, S. 1994. The status of the Zanzibar leopard. Zanzibar: Dept. of Commercial Crops, Fruits and Forestry. Masoud, T. S. 1999. Incorporating trophy hunting in small antelope management programmes: feasibility study for Jozani–Chwaka Bay Conservation Area, Zanzibar, Tanzania. M.Sc. thesis. Durrell Institute of Conservation and Ecology, University of Kent at Canterbury. Mayles, S. W. 1997. A description of Unguja’s African civet based on a study of civetries. Zanzibar Forestry Technical Paper 81. Zanzibar: Dept. of Commercial Crops, Fruits and Forestry, School of International Training. Meester, J. & Setzer, H. W. (eds.) 1971. The mammals of Africa: an identifi cation manual. Washington, D. C.: Smithsonian Institution Press. Mills, G. & Hes, L. 1997. The complete book of southern African mammals. Cape Town: Struik Winchester. Moreau, R. E. & Pakenham, R. H. W. 1941. The land vertebrates of Pemba, Zanzibar, and Mafi a: a zoogeographical study. Proceedings of the Zoological Society of London (Ser. A) 110, 97–128. Nahonyo, C. L., Mwasumbi, L. B., Eliapenda, S., Msuya, C., Mwansasu, C., Suya, T. M., Mponda, B. O. & Kihaule, P. 2002. Jozani–Chwaka Bay proposed national park biodiversity inventory report. Zanzibar: Dept. of Commercial Crops, Fruits and Forestry, CARE–Tanzania. Nyanje, P. 2003. Tanzania has 34.56 million people—Mkapa. The Guardian 1 January, p. 1. Othman, W. J. & Rijali, H. A. 1997. Island wide red colobus census in Zanzibar. Zanzibar Forestry Technical Paper 90. Zanzibar: Dept. of Commercial Crops, Fruits and Forestry. Pakenham, R. H. W. 1984. The mammals of Zanzibar and Pemba islands. Harpenden: printed privately. Plage, D. & Plage, M. 1985. In the shadow of Krakatau: return of Java’s wildlife. National Geographic 167, 750–771. Pocock, R. I. 1932. The leopards of Africa. Proceedings of the Zoological Society of London, 543–591. Revkin, A. C. 2001. Hidden cameras capture world of the rare and wild. New York Times July 31. Robins, R. J. 1976. The composition of the Josani Forest, Zanzibar. Botanical Journal of the Linnean Society 72, 233–234. Rodgers, W. A. & Burgess, N. D. 2000. Taking conservation action. In N. D. Burgess & G. P. Clarke (eds. ): Coastal forests of eastern Africa. Pp. 317–334. Cambridge: IUCN. Selkow, B. 1995. A survey of villager perceptions of the Zanzibar leopard. Zanzibar: Dept. of Commercial Crops, Fruits and Forestry. Siex K. S. & Struhsaker, T. T. 1999a. Ecology of the Zanzibar red colobus monkey: demographic variability and habitat stability. International Journal of Primatology 20, 163–192. Siex K. S. & Struhsaker, T. T. 1999b. Colobus monkeys and coconuts: a study of perceived human– wildlife confl icts. Journal of Applied Ecology 36, 1009–1020. Spalton, A. 2002. Chasing the leopard’s tail. BBC Wildlife August, 28–34. Struhsaker, T. T. & Siex K. S. 1998. Translocation and introduction of the Zanzibar red colobus monkey: success and failure with an endangered island endemic. Oryx 32, 277–284. Stuart, C. & Stuart, T. 1997. A preliminary faunal survey of south-eastern Unguja (Zanzibar) with special emphasis on the leopard Panthera pardus adersi. Zanzibar Forestry Technical Paper 88. Zanzibar: Dept. of Commercial Crops, Fruits and Forestry, and Loxton, South Africa: African–Arabian Wildlife Research Centre. Taylor-Ide, J. O. 2000. In search of the clouded leopard. National Geographic September 2000, 114 – 123. Ullas Karanth, K. 1995. Estimating tiger Panthera tigris populations from camera-trap data using capture–recapture models. Biological Conservation 71, 333–338. United Republic of Tanzania 1991. 1988 population census: Unguja regional profi le. Dar es Salaam: President’s Offi ce, Planning Commission, Bureau of Statistics. Van Rompaey, H. & Colyn, M. 1998. A new servaline genet (Carnivora, Viverridae) from Zanzibar island. South African Journal of Zoology 33, 42–46. Weaber, K. K. 1997. Zanzibar red colobus monkey (Procolobus kirkii) distribution in Jozani Forest Reserve. Zanzibar Forestry Technical Paper 80. Zanzibar: Dept. of Commercial Crops, Fruits and Forestry, School of International Training. Williams, A., Masoud, T. S. & W. Othman 1998. Community-based conservation: experiences from Zanzibar. Gatekeeper Series 80. London: International Institute for Environment and Development. Williams, A. J., Mwinyi, A. A. & Ali, S. J. 1996. A population survey of the three mini-antelopes— Ader’s duiker (Cephalophus adersi), Zanzibar blue duiker (Cephalophus monticola sundevalli), suni (Neotragus moschatus moschatus)—of Unguja, Zanzibar. Zanzibar Forestry Technical Paper 26. Zanzibar: Dept. of Commercial Crops, Fruits and Forestry. Yoon, C. K. 2002. Forces are joined to track an elusive, endangered cheetah. New York Times 8 January, D5. Zanzibar Revolutionary Government 1992. Household budget survey 1991. Volume III. Basic social demog raphic and housing characteristics. Zanzibar: Dept. of Statistics, Ministry of Planning. Zanzibar Revolutionary Government 1997. The Environmental Management for Sustainable Development Act 1996. Zanzibar: Government Printer. Zanzibar Revolutionary Government 1997. The Forest Resources Management and Conservation Act no. 10 of 1996. Zanzibar: Government Printer.